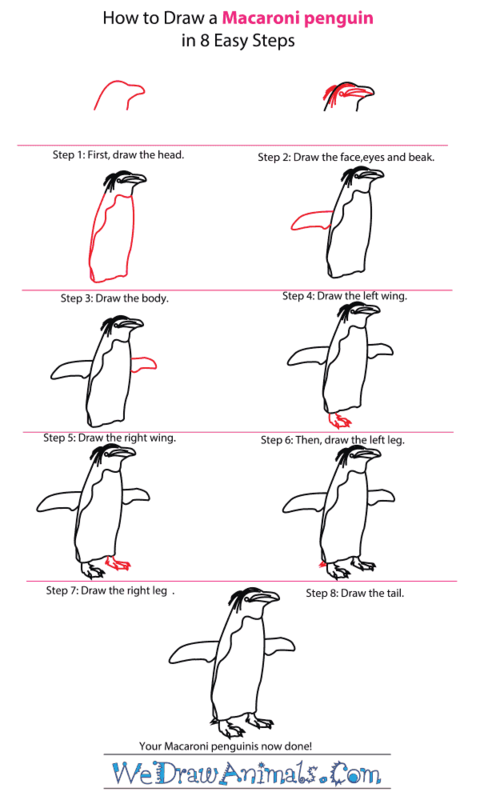 In this quick tutorial you'll learn how to draw a Macaroni Penguin in 8 easy steps - great for kids and novice artists. 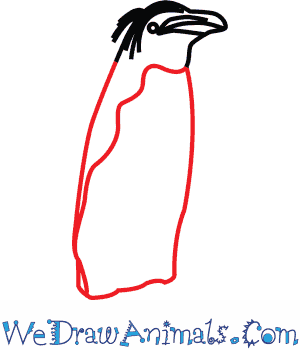 At the bottom you can read some interesting facts about the Macaroni Penguin. 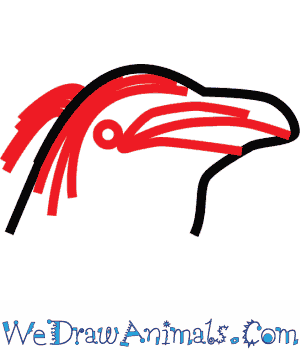 Step 2: Next, draw the beak, eye, and hair. 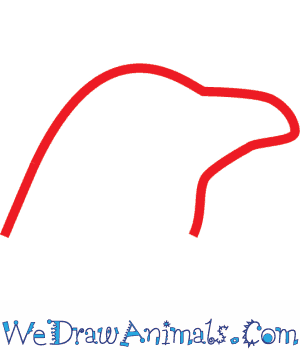 Draw a little circle at the corner of the beak to make the eye. Draw the hair on the back of the head. Step 5: Draw the right wing on the other side. Make it smaller since it is further away. 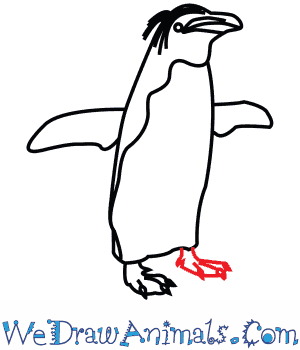 Step 6: Draw the left foot. 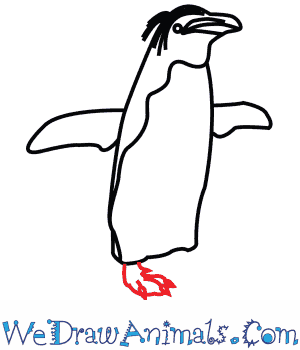 Remember that penguins have webbed feet. Don't forget to draw the claws. 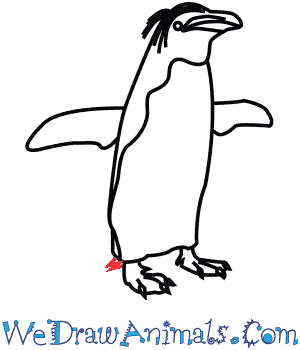 Step 8: To finish, draw a little tail behind the left foot. 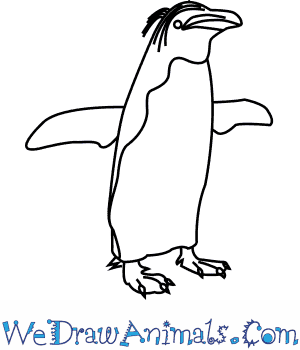 Color your penguin to make it come to life. 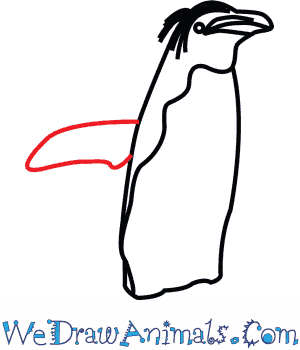 The Macaroni Penguin is a member of the bird family and the scientific term for them is Eudyptes chrysolophus. The proper name Macaroni refers to the appearance of ornamental fashion on their head, as in the song Yankee Doodle with the lyrics “stuck a feather in his hat and called it macaroni.” The scientific name means “good” (Eu) “diver” (dyptes) and “golden” (chryso) “crest” (lophus) in Latin. The animal was first documented in 1826. This species can dive under water for over 2 minutes long. The animal can dive under water to about 330 feet deep. They can catch up to 50 animals for food on a single dive. The animal can weigh up to over 14 pounds. They commonly grow up to over 2 feet tall. 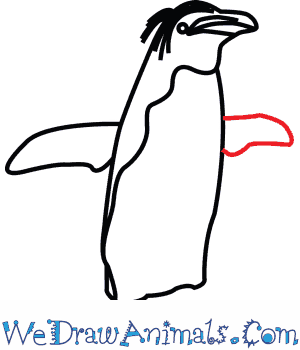 As with all penguins, this bird cannot fly. They live on islands between Antarctica and Argentina, between South America and South Africa. In this region, they eat a variety of crustaceans. As a strategy for catching them, they swallow stones to help them reduce their floating tendency, so that they can dive deep enough to locate more food. This method also helps to grind the food in their stomach for better digestion. Since there are so few of these creatures, they are vulnerable to extinction.